In addition to hand dryer manufacturers designing new machines to absorb or divert water runoff, end users can also purchase hand dryer matting to prevent water and soap residue from collecting on restroom floors. These mats not only avert the spread of germs that can harbor in pools of water, but can also prevent slips and falls. According to the Occupational Safety and Health Administration (OSHA), accidental falls account for the majority of general industrial accidents, with more than 12,000 injury cases, annually. Most slips and falls happen on wet surfaces. Because building restrooms are often covered in smooth surfaces, such as tile, linoleum or concrete, they pose an especially high risk of injury. Hand dryer matting can provide an extra line of defense against these types of accidents. 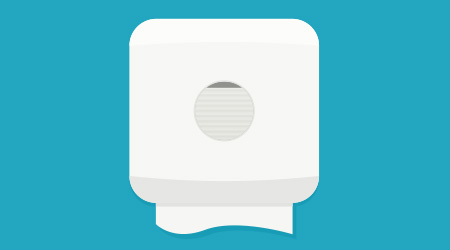 Hand dryer mats can be placed under dryers and can collect up to 16 ounces of fluid before they need to be changed or disposed of — usually within 30 days. Some of these mats come with an adhesive backing to further ensure floor traction. They can also serve as a barricade from the water splashing that occurs on restroom walls. While most hand dryer mats are made of rubber and other materials, there are also reusable hand dryer mats made of carpet, which may include an anti-microbial bonding agent on the carpet fibers to prevent germs and potential odors. Keith Loria is a freelance writer based in Oakton, Virginia.